One Christmas night, Our Lord, denying Himself the comfort of visiting those households where He knows He is loved, came down into the midst of a modern city to see what sinners were doing. Christmas!… Christmas!… Joy was universal. Everyone was celebrating. 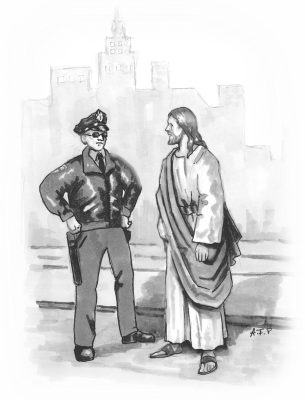 Christ encountered a policeman completely engrossed in directing traffic in a busy plaza. Every store glittered with worldly displays. Really, what was behind it? 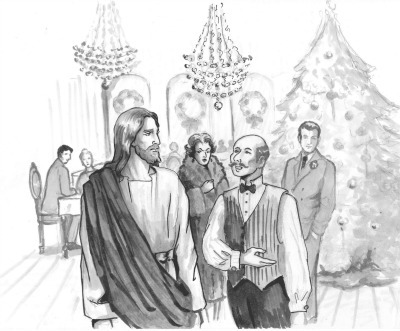 Christ paused by a restaurant advertising “Christmas Party — $50.00.” Ladies and gentlemen in elegant evening attire were entering the place. Tables, covered with white linen and lighted with red and green candles, were arranged in rows. Bottles of champagne, with gilded foil about their necks, nestled in ice-filled silver pails. But He was already being shoved out into the street — as the woman playing the piano sang, “Peace on earth and mercy mild.” Not even the Roman soldiers had been so hasty. Outside, Christ allowed Himself to be swept along by the throng that flowed like a river between the stores and markets. He saw toys, and more toys, everywhere, and a few Santa Clauses, but rarely a manger scene. Our Lord then caught sight of a married couple carrying a few small, precious bundles. They seemed to be good, middle-class, peace-loving souls, hurrying somewhere to celebrate Christmas. Christ followed them, invisible to their eyes. They entered their home and climbed the staircase to their apartment, where others had already gathered. He watched as they opened bottles, served pastries, and then as they ate and drank. The apartment had neither a crucifix nor a manger scene. Christ could not long endure the senseless conversation, so He turned away and slowly descended the staircase. Ah, children, little children! Our Lord went in. There were hundreds of children inside, receiving toys, candy, and books. As they noisily ran and tumbled about, important looking women hurried under the gaze of a headmistress. Again, neither a manger scene nor a crucifix could be seen, and nobody mentioned the name of the Child Jesus. As Christ stood there, a feeling of isolation grew in His heart. He was a trespasser. Finally, He approached a young boy whose arms overflowed with toys. The boy reminded Him of His little friends of bygone days in Bethlehem. Christ again walked through the streets, no longer entering any of the places He passed. He wandered as His mother had in Bethlehem, on a night like this and on the same date so long ago. He roamed through the endless streets, passing innumerable places where His creatures celebrated Christmas without knowing its true meaning. 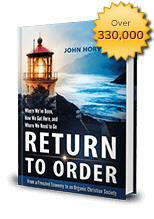 He hesitated to return to Heaven with such observations, for they would sadden the saints. Weary, He came to the edge of a neglected suburb. A white building ablaze with tiny lights caught His eye. Approaching and looking through one of the windows, He saw His own image prominently displayed on the wall. His eyes brightened, as if reflecting the hundreds of lights outside, when He noticed that in one corner of the room was a simple, but attractively arranged, manger scene. Just then the door opened and a boy came out, a boy like those who not infrequently come under the care of a parish. The boy stopped abruptly at the sight of the golden-haired man shivering in the darkness. Icy gusts blew around them. “I am quite cold,” answered Our Lord. And so Our Lord entered. 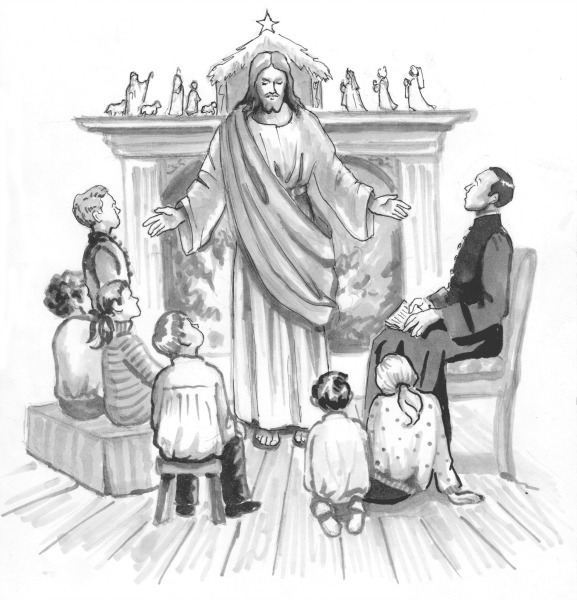 Near the fireplace, a group of children were closely gathered around a young priest. As the fire crackled and filled the room with its warmth and light, the priest told the children about the infinite grandeur hidden within the little figure of the Child Jesus in the manger. He stopped his tale the moment Our Lord entered the room. The children promptly offered the newcomer a place close to the fire. Christ’s gaze slowly passed over all of them, one by one, as if He were memorizing every little face. Above all, He gazed at the young priest. “Are you alone, my friend?” asked the priest kindly. Seized by soul-stirring curiosity, all eyes turned inquisitively upon the stranger, waiting. Christ did not speak. Very slowly, regally, Jesus’ hand moved. He extended it over their heads, reaching beyond the humble cottages of that neighborhood and encompassing that immense city whose miseries He had witnessed close up. In a tone of voice that none of those present would ever forget, He exclaimed: “Misereor super turbas” – I have pity upon these people! Then, slowly, before their astonished eyes He disappeared. “It was Jesus!” cried one of the boys. This entry was posted in Featured and tagged advent, Christ, Christmas, Christmas spirit by Pierre L'Ermite. Bookmark the permalink.